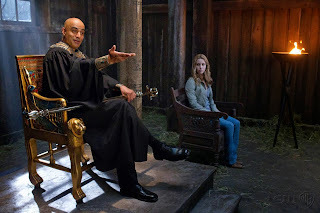 Supernatural 7x04 "Defending Your Life"
After a lot of Leviathan-ness the last three episodes, tonight the boys got back to brass tacks with a seemingly run of the mill ghost case. Of course, nothing is really run of the mill anymore, right? A regular ghost haunting? Pish posh! That's some kid stuff, that is. And when they're burning bones before the first commercial break, thinking they're done, hell, we all know it's more complicated than that. After a couple guys get offed in rather strange ways - one seemingly by being hit by a car while in an upstairs apartment, another getting mauled by a dog in a bathroom - the boys notice that they both have a couple things in common. The car guy? Had killed a girl in a car accident. The dog guy? Had done something that made him do community service with an animal shelter. Alas, I do not really remember more than that about him, nor does it particularly matter. So, their deaths were basically like getting what they deserved. Except, they'd both made up for what they did over the years, so that didn't particularly make sense either. On top of which, they also both seemed to have mysterious red dirt near them where they died. Beware random suspicious red dirt! The pair head off in the impala to check out where the red dirt came from (an apple orchard, if you must know), and nearly run into a clearly freaked out dude in the middle of the road. They take him back to their crappy motel of the moment, and he tells them he had been held on some kind of funky trial after he went to this bar. He killed some people years ago, blah de blah. Basically what we need to know from this - weird trial, some funky symbols, the bar he was at was also where one of the other guys had visited. The boys then split up, which is nearly always a recipe for disaster, with Sam going back to the orchard and Dean going to check out the bar. Dean starts chatting up the pretty bar maiden while downing a LOT of scotch. Sam, meanwhile, finds this red barn the dude from the middle of the road was talking about, only he gets a call from Bobby before he can explore too much. Bobby has figured out that the thing they're dealing with is an Egyptian god - Osiris - who hunts down those who feel guilty and put them on trial. Bobby very wisely points out that they should get the hell out of there because, hello, Dean is mister guilt city. Of course, by then, it's too late. Dean has already been picked up by Osiris after a rather adorable attempt at psyching himself up to get some action with the bar maiden. Luckily, she has the wherewithal to find Dean's dropped phone and answer it when Sam calls. He finds some more random suspicious red dirt (beware!) and proceeds back to the red barn he was just at. And just in time, because Osiris has Dean all trussed up and ready for trial. Sam, a former pre-law student as he is, says he's going to be Dean's defense. And so begins the guilt trial. Osiris brings up his first witness - Jo. Osiris basically insinuates that she got into hunting because she was crushing on Dean, though Sam manages to also point out that it was more likely that she did it because of her dad. Next witness - Sam himself! Osiris discusses how Sam was on the path to a normal and happy life with Jess until Dean came back around, and though that is hard to argue with, Sam does, saying he would've been pulled back into the life at some point anyway. Though this is great, we learn that it's not Osiris that needs convincing, it's Dean himself. Uh oh, that could be a problem. So, Sam calls up Dean to the stand. He basically gets him to say that he doesn't blame himself for things he can't control, but when Osiris threatens a third witness (which we are led to believe would've been what's-her-name that he killed last week), Dean says to just end it now. In that case? He's guilty. But not to worry! He's got Sam and Bobby looking out for him, and it turns out Bobby has found a temporary fix to the situation. They just have to find a ram's horn and stick it in Osiris, and he'll be gone for a couple hundred years. Okey dokey, off to a synagogue Sam goes to find such a horn, leaving Dean to encircle himself in some salt and wait for spectral Jo to come put him to his death. Jo does show up, and they have a nice little chat, wherein she basically tells him she doesn't blame him for what happened, and she wouldn't be doing this if Osiris wasn't forcing her to. What's particularly upsetting about the way she's going to kill him is in how it mirrors her own death. She turns on the gas from the stove and gets ready to use Dean's lighter to burn the place down with him inside. Luckily, that happens to be right after Sam has located a ram's horn and stabbed Osiris. Jo flickers out of being, leaving Dean to wrestle with his guilty conscience on his own time. In the end, Dean wonders why Sam wasn't brought to trial the same as Dean. Sam says that after all he had to deal with in hell, he figures he's done his time. The past is the past and all that. Poor Dean wishes he could feel the same way, but alas, for now, he can't. Pretty sad when someone who frequently sees Hal-Luci-nations is feeling better than you, Dean, huh? - Dean is seriously depressed. He seems like he barely wants to get up and do anything. And the drinking? At least they're starting to make some comments about it, though I do wonder if more serious discussions of it will happen or not. Tonight's episode was the most blatant they've been about it, with Dean saying AA gives him the jeebs (I wonder why!) and Sam being concerned about his drinking on more than one occasion. - Not that I don't like Bobby, but I do wonder if they use him a little too often now. - Aw, Dean has to psych himself up before going home with the ladies now. His season one self would not believe it. Sam: Some kind of ghost? Dean: With a license. ... License to kill. Sam (talking about a guy who was killed by a dog): He was in the restroom of a diner. Dean: Yeah. That doesn't sound right. Great review Jen as always. I think this episode sucked it's up for contention as worst episode of all time! The car gag was just taht a laughable gag, a little girl ghost stalking him would have been more sufficiant but like you said all these people already suffered for their crimes so it made little sense whatsoever. The license to kill gag also made no sense the boys look as if this was new to them, we all know the boys have already tackled a ghost and his ghost car. The racist truck ghost anybody. A huge continuity error. Dean really is depressing not only to himself but the viewer he's nothing more than a shell of his former self and it's really boring to see this every week, if there is anything more drawn out it's this I'm guilty for crap I know isn't my fault but I'm gonna sulk over it anyway, trait. Anymore and I'm afraid it will seriously kill the show. If Sam and/or Bobby were really worried about him they would have addressed his depression and alcoholism sooner. Though with two apocalypses that probably complicated things. I liked the trial idea and having Jo back (haha, I totally typed Ho by accident there) to hear her thoughts post death. I, too, am getting a little tired of DepressedDean. The alcohol thing is out of nowhere. I mean, he's always drank and now it matters? Why is Dean going dark and depressed? Is it losing Cas? They aren't selling it that way. It's like some random sudden "I feel bad for the life we've been living for forever." Why now? Because it's Dean's turn to have a season long whiny arc? Having said all of that, it's still the best show on TV for my money. I just miss the old stuff, when the boys were happy and fighting something tangible together instead of one's repressed memories and the others' depression. Here here Laura! Looking back though Dean has had his whiny arcs, it wasn't until the reign of Sera that these arcs became amplified and the main focus of the show. The problem is the personal depressions of Sam and Dean have overshadowed the plots themselves during these later years. So, instead of the whininess interfering with a major monster hunt it's now the monster hunt pushing it's way into the featured whiny arc. In season one Dean was the extremely confident suave ghost hunter. That was really the only time we see him fully in control of himself. Season 2 would be when he went on his hunts with a death wish and started his downward spiral. The ep "Children Shouldn't Play with Dead Things" is a prime example of that, Dean staking the zombie girl to the ground "those dead should rmain dead" the girl was a mirror of Dean, and by wanting to end her it became known to us that he wanted to die. Although we got the same cool Dean in some episodes his emo personality really pushed through during the later half of season 3 and he's been that way ever since. It's time for change, or else there will be no season 8. Myself, I don't see the drinking stuff coming out of nowhere. Particularly since his time in Hell, Dean has relied on drinking to get him through all the crap he tries to bottle up so he doesn't have to feel it so much. Lately it's just become more obviously a problem. He's always had this guilty conscience that weighs on him more than it should, he just used to be better at hiding it. While I understand the way many people miss "the old days," the show has to be about growth and change, or else it's just another procedural. They do sometimes have a tendency to revisit the same issues, it's true. But being in season seven, and still producing a quality show week in and week out, I'd say the track record is pretty good... racist ghost monster trucks aside.